Is Mother Earth a Remedy for Diabetes? Diabetes is a worldwide scourge, rising at an alarming rate, and now affecting some 347 million people. Common causes are well known: excess weight, poor diet, and physical inactivity. However, I would like to raise another cause, and something you would never think about: the increasing human disconnection from the Earth’s natural, negative electric surface charge. In past reports on this website, I have reported about Earthing (also called grounding), a term referring to the discovery of significant benefits – such as better sleep, reduced inflammation, and lessened pain – resulting from walking barefoot outdoors or sitting, working, or sleeping indoors in contact with conductive systems that transfer the Earth’s natural energy from the ground into the body. It is an unfamiliar, but well-established scientific fact, that the diverse surface of the Earth is the most negatively charged entity in the immediate human environment, the effect of a virtually limitless, unseen, and continuously renewed reservoir of free electrons. Emerging research, which I am proud to be part of, is revealing that direct physical contact with this electrodynamic surface indeed promotes intriguing physiological changes that accompany both measurable and subjective reports of enhanced well-being. Maintaining contact with the ground allows your body to naturally receive and become charged with these electrons. When thus “grounded,” you automatically absorb the electrons, which in turn quickly reduce electrical imbalances in the body and the oxidative free radicals involved in chronic inflammation and multiple diseases. The body’s natural electrical state is restored. But modern lifestyle has separated humans from this planetary resource, which throughout most of human history was an inseparable part of ordinary living. We walked barefoot and used conductive animal hides for footwear and bedding. Now, we wear insulating shoes made of plastic and rubber composites. We sleep on elevated beds. We are disconnected. In the book Earthing:The Most Important Health Discovery Ever!, my colleagues and I put forward the hypothesis that the disconnection with the Earth represents an important, insidious, and overlooked contribution to physiological dysfunction and to the alarming global rise in non-communicable, inflammatory-related diseases, including diabetes. We believe that the disconnection creates an electron deficiency state in the body, leading to an erosion of vitality and efficiency. The question arises, as the chart below (Fig 1.) poses graphically, as to whether this observation is a correlation or a coincidence. Is the loss of our electrical roots a factor in the rise of diabetes and other inflammatory diseases that parallels the proliferation of sedentary living and overconsumption of calorie-rich, nutrient-poor food loaded with sugar and high fructose corn syrup (HFC) sweeteners? Fig. 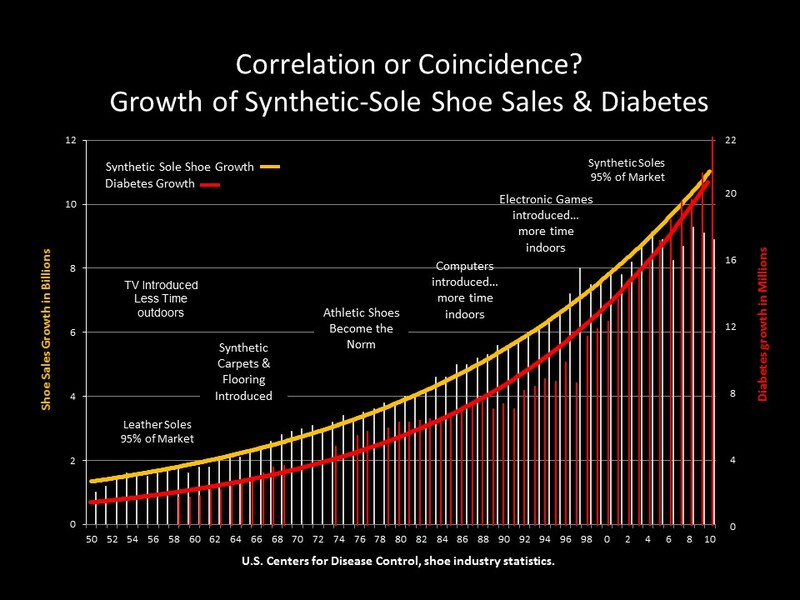 1 This chart shows a similar curve growth in the incidence of type 2 diabetes and sales of synthetic-sole shoes in the U.S. since the 1950s. At that time, 95 percent of shoes were made with leather soles, many of which were conductive. Currently, 95 percent of shoes have synthetic, non-conductive soles. How can Mother Earth benefit diabetes? Here are some specific ideas. The influx of electrons into the body reduces chronic inflammation. That’s a head-to-toe effect. Theoretically, it remedies a common electron deficiency by quenching/neutralizing positively charged free radicals involved in chronic inflammation. Contact with the Earth restores the body’s electrical stability and this in turn has a major effect in restoring order to the normal functioning of all body systems. We are, after all, bioelectrical beings. Earthing also counteracts stress by promoting a calming mode in the autonomic nervous system (ANS) that regulates functions such as heart and respiration rates, and digestion. Earthing rapidly shifts the ANS away from a typically overactive sympathetic mode associated with stress. A study I conducted with electrophysiologist Gaétan Chevalier demonstrated how Earthing improves heart rate variability (HRV), the very subtle variations in heartbeat intervals that are regarded as an important indicator of balanced ANS. ANS and HRV are commonly disturbed by stress and represents an increased risk for arrhythmias and sudden cardiac death. Moreover, abnormalities in HRV are regarded as early evidence of cardiovascular autonomic neuropathy, a serious but widely overlooked complication of diabetes that damages nerve fibers that supply the heart and blood vessels. Such abnormalities can result in aberrant heart rate control and vascular issues. Earthing also appears to help control the blood glucose level. I have heard that from individuals with diabetes. I have also seen objective evidence in an unpublished year-long laboratory study that showed a small but significant reduction in the glucose level of grounded rodents compared to non-grounded animals. Two other biochemical markers, triglycerides and alkaline phosphatase, were also lower, suggesting less risk of diseases linked to the metabolic syndrome, such as hypertension and diabetes. In the study, we grounded ten healthy subjects for two hours, took blood samples before and after, and measured the negative charge on the red blood cells of each sample. The effect of this charge goes by the name of zeta potential; the higher the negative charge, the better ability of the blood cells to repel each other and prevent unwanted clumping and clotting. The results indicated a nearly three-fold increase, on average, of the zeta potential, with obvious significant improvements in the electrodynamics, blood cell movement, and aggregation of the red blood cells. Seen through a microscope, we clearly observed thinning and less clumping of the cells. Improved zeta potential is extremely important because so many diabetics suffer with poor circulation and neuropathy (nerve damage) in the legs and feet. The changes we have seen help explain why diabetic patients describe signs of better circulation in their extremities. In my ongoing research, I came across a fascinating 2008 study in the international journal Biochimica et Biophysica Acta that reported, for the first time, on the zeta potential of red blood cells in diabetics. The researchers, from the University of Calcutta, said they discovered “a remarkable alteration” in the electrodynamics of red blood cells, and specifically a progressive deterioration of the zeta potential among diabetics and, at the worst, among diabetics with cardiovascular disease. In the second part of this article, I share the experiences of two doctors in Europe and a doctor in Australia who have made similar observations to mine regarding Earthing and diabetes. Chevalier G, Sinatra ST. Emotional stress, heart rate variability, grounding, and improved autonomic tone: Clinical applications. Integrative Medicine: A Clinician’s Journal 2011; 10(3): 16-21. Chevalier G, Sinatra ST, Oschman JL, et al. Earthing (grounding) the human body reduces blood viscosity: A major factor in cardiovascular disease.” Journal of Alternative and Complementary Medicine 2013; 19(2): 102-110. Adak S, et al. Dynamic and electrokinetic behavior of erythrocyte membrane in diabetes mellitus and diabetic cardiovascular disease. Biochimica et Biophysica, 2008; 1780: 108–15. Skretteberg PT, et al. Interaction between inflammation and blood viscosity predicts cardiovascular mortality. Scand Cardiovasc, 2010;44(2):107-12. Tamariz LJ, et al. Blood viscosity and hematocrit as risk factors for type 2 diabetes mellitus. Am J Epidemiol, 2008;168(10):1153-60. Vinik AI, Ziegler D. Diabetic cardiovascular autonomic neuropathy. Circulation.2007;115: 387-397.